Kelly Richardson (Canadian, born 1972). 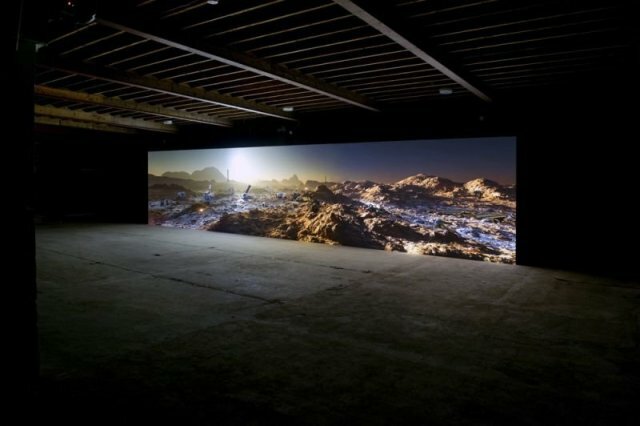 Installation view of Mariner 9, 2012. Three-channel high-definition video installation with 5.1 audio. Running time: 20 minutes. Originally commissioned by Tyneside Cinema, UK. Image courtesy the artist and Birch Libralato. Photograph by Colin Davison. In her work, Kelly Richardson (Canadian, born 1972) explores the "hyper-real," a notion that, due to our increased use of new media and forms of simulation, we can no longer distinguish the real from the constructed. Richardson is fascinated by the ways we connect with landscape; within her deeply layered practice, she draws on narrative devices used in science fiction and B-movie horror films, as well as nineteenth-century landscape painting, with particular interest in the apocalyptic conjurings of John Martin (British, 1789-1854). The results are complex cinematic installations that present us with seemingly "real" locations subtly doctored with technology, animation, and sound. These unsettling portals into otherworldly atmospheres lack any physical human presence, but suggest the residual effects mankind has had on the natural world. Hauntingly poignant in their post-apocalyptic beauty, Richardson's installations are a resurrection of The Sublime-playing on our greatest fears through awe-inspiring visuals that offer us a rare glimpse into what the future may hold. Kelly Richardson: Legion is a major mid-career survey exhibition that takes an extensive look at Richardson's audio-visual installation works of the past fifteen years. The project, initiated by curator Alistair Robinson, debuted at the Northern Gallery for Contemporary Art in Sunderland, England, on July 5, 2012, coinciding with the premiere of Mariner 9, 2012, a major new three-channel video installation commissioned by the Pixel Palace at Tyneside Cinema in Newcastle, England. The exhibition, now on view at the Grundy Art Gallery in Blackpool, England (October 13, 2012-January 5, 2013), will travel to the Towner in Eastbourne, England (January 19-March 31, 2013); the Albright-Knox in Buffalo (February 15-June 9, 2013); and the Contemporary Art Gallery in Vancouver (late 2013-early 2014). A major catalogue co-published by the Northern Gallery for Contemporary Art and SAAG (Southern Alberta Art Gallery), with essays by Robinson, Hirshhorn Museum and Sculpture Garden Associate Curator Kelly Gordon, and Albright-Knox Curator for the Collection Holly E. Hughes, will be available in January 2013. Organized by Hughes, the Albright-Knox's version of the exhibition will be the largest and most comprehensive presentation of Richardson's work on the tour and to date. The Gallery currently holds the most works by the artist in a museum, having acquired three of her video installations since 2008. Featuring approximately fifteen works by the artist spanning the entirety of her career, the exhibition at the Gallery will also serve as the United States debut for Mariner 9, 2012, which has received accolades and critical acclaim since its initial presentation in Whitley Bay, England, earlier this year.